This bilingual picture book introduces an imaginative girl and the art and music of the Caribbean. Young Sofi enters a New York City community garden and finds a half-painted mural. It’s full of big, leafy plants in blue and yellow, and a vibrant emerald green color appears where the two colors meet. As Sofi runs her fingers over the image, she is suddenly transported to a beautiful place with plants just like the ones on the wall! Sofi finds herself in the Dominican Republic, where she meets a young boy named Juan Luis. He is writing a song, but he’s stuck on the lyrics and needs her help. After they finish the song, the pair flies over the river that separates San Pedro de Macoris from Haiti. There, Juan Luis introduces her to his friend, Güerlande, a young metal artist. She also needs Sofi’s help. Can she make just the right shade of purple to paint Güerlande’s huge mermaid sculpture? 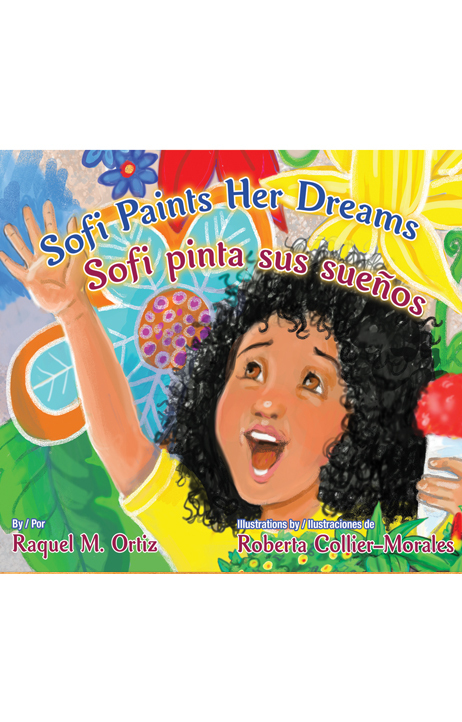 This bilingual picture book about an imaginative girl and an enchanted mural is an engaging exploration of the cultural traditions of the Caribbean. The sequel to Sofi and the Magic, Musical Mural / Sofi y el mágico mural musical, this story introduces young readers to the art and music of the gorgeous island of Hispaniola. Kids will be encouraged to explore their own artistic talents after reading about internationally acclaimed Dominican musician, Juan Luis Guerra, and Haitian artist, Güerlande Balan. RAQUEL M. ORTIZ was born and raised in Lorain, Ohio. She is the author of a bilingual picture book, Sofi and the Magic, Musical Mural / Sofi y el mágico mural musical (Arte Público Press, 2015). She has worked at The Brooklyn Museum, the Allen Memorial Art Museum and El Museo del Barrio. Currently she creates educational material for the Puerto Rican Heritage Cultural Ambassadors Program at the Center for Puerto Rican Studies at Hunter College in New York City. ROBERTA COLLIER-MORALES has illustrated numerous books for kids, including Salsa (Piñata Books, 1998). A member of The Society of Children’s Book Writers and Illustrators, she lives and works in Longmont, Colorado.